If you have a kid or have had to purchase a gift for one recently, chances are you've heard of Fingerlings. They're a hot toy and the craze doesn't seem to be going away anytime soon. As part of the Fingerlings line, there's two new Fingerlings as you've never seen them before - big and soft! Favorite Fingerlings characters Boris and Bella are now interactive cuddle monkeys, and the product launch date for them is today. 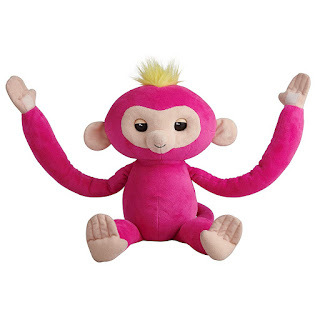 Fingerlings Hugs are soft cuddly monkeys with long arms. There's Bella (Pink) and Boris (Blue). You can swing them, pet them, give a kiss, and even rock them to sleep. They make several cutesy noises. To really make the kids giggle, Fingerlings Hugs will fart if you shake them! One fun feature is that your child can record what they say, and the Fingerlings Hugs plush will repeat it back to them in a silly, kitchsy manner. This is done by holding the left ear and talking, then letting go when done. The monkey will repeat what was said. My nieces got a kick out of making up phrases and hearing them being repeated back. Fingerlings Hugs are a cute, fun addition to the Fingerlings toy line. I saw those at the store a few weeks back. They look cute! Cute! Thanks so much for stopping by!! These look like they would be a lot of fun for my granddaughters.